The OSAA appreciates the vital role that officials play in the administration of high school activities. We hope you'll find what you need on the OSAA website and our links to other sites and resources. This page is intended to assist you in achieving your goals as an official and to help clarify the policies regarding officials. All high school officials and associations are certified and chartered by the OSAA for the following sports: football, volleyball, soccer, basketball, wrestling, baseball, and softball. "One Rule, One Mechanic, One Interpretation"
All OSAA certified officials are members of the OAOA. Officials are encouraged to contact the OAOA directly for any questions or further clarification. A lot of information and great resources for officials can be found on the OSAA/OAOA Central Hub hosted on ArbiterSports. Officials registration, testing, training, and a lot more information is up on the Central Hub. Click the Central Hub button or one of the icons below. The OSAA holds several rules clinics for each sport prior to each sports season for commissioners of local associations. The OSAA works closely with several professional organizations that relate to high school athletic officials. Follow the links below for additional information. In effort to assist Local Officials Association recruit officials, the OSAA and the OAOA have created a repository of recruitment resources. These resources include marketing ideas, template brochures, media files, and other helpful materials. The help associations connect with new officials, a new webpage has been created for people who may be interested in becoming an official. This site is ideal to include on promotional materials, it has a short and easy to remember URL, and it has a tool to connect potential new officials with commissioners. Associations should build a schedule for the whole calendar year. Include on your annual schedule when to start recruitment before your sport's season. It is recommended to start recruiting efforts at least 2 months prior to the start of your season. Do you have something to share? E-mail recruitment resources to Jack Folliard, jfolliard@comcast.net, to have your item posted to this page. The OSAA ad-hoc Officials Recruitment and Retention Committee meeting schedule and minutes can be found on the committee page. Current officials and association leaders are already likely to know to perks of officiating. Sometimes, there are other aspects that may be overlooked. Below is a list that associations and officials have come up with to draw new officials. It's a great way to stay involved in the sport. The great thing about being an official is that you are an active participant in the game and you actually get to be on the field and not on the sideline or in the stands. Officiating is a way to give something back to the community. The sports official is a role model who is charged with enforcing the concepts of fair play and good sportsmanship. It provides a unique opportunity to positively influence young people. Officiating affords an individual the opportunity to develop interpersonal skills and to hone one's judgment skills. Officiating requires you to make instantaneous decisions, resolve conflicts, and deal with stress and pressure. It demands good communications skills and the ability to think on your feet. The ability to work a game fairly and smoothly is a skill one can be proud of. Online advertising, also called online marketing or Internet advertising or web advertising, is a form of marketing and advertising which uses the Internet to deliver promotional marketing messages to consumers. This includes email marketing, search engine marketing (SEM), social media marketing, many types of display advertising (including web banner advertising), and mobile advertising. Online advertising is widely used across virtually all industry sectors and many associations have had increased response to online ads. Send Jack Folliard, jfolliard@comcast.net, your recruiting ideas. Suggested by Ken Woods, Commissioner of Salem Football Officials Association. 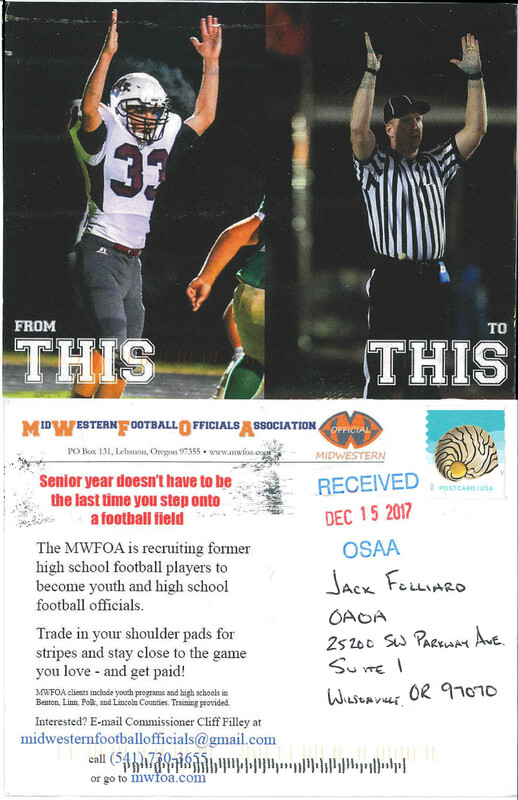 Member recruits a new official, that new official registers with the OSAA, receives a packet, attends weekly training classes, and works a schedule. The next year, this same rookie official comes back and registers with the OSAA for the second year, the recruiting official receives $40 cash from the association at the beginning of the season. If you recruit two new officials, you receive $80 cash, if you recruit three or more, you receive $100 cash (cap at some amount, i.e. $100 maximum). Suggested by Cliff Filley, Commissioner of Mid-Western Football Officials Association. Create postcards targeting high school seniors. Offer the ability to stay in the game and get paid. Send a supply to high school athletic departments for inclusion in award ceremonies or for distribution to seniors. First, determine which sport and Local Officials Association you want to join. You can use the Association Lookup Tool to find the closest association near a given ZIP code or high school. The Associations tab also contains a list of all Local Official Associations. Yes, continue on to Step 3. No, if you are under 18 years old, you will need to contact your association's Commissioner in order to request an exception for youth referees. (These exceptions start with Commissioners, contact your Commissioner with an email expressing your interest to officiate.) Your Commissioner will then provide you with different registration instructions; do not continue to Step 3. Oregon Portal - this portal should be selected if you are a member or plan to be a member of a Local Officials Association chartered in the state of Oregon in any of the seven sports (Football, Soccer, Volleyball, Basketball, Baseball, or Softball). Affiliate Portal - this portal should be selected if you are a member of an officiating association located outside of Oregon but will be officiating contests within Oregon's border. This option should also be selected if the Commissioner of your association has indicated that you should complete the affiliate registration process even though you may be a member of an Oregon association. Look for your Officials Packet in the mail. Your packet includes an OSAA badge and rules books. See the "Registration Fees" table and "Officials Packets" section for additional information. Complete the required annual Certification Tests. Refer to the Certification/Eligibility tab for additional information including all certification requirements for officials, links to online rules exams, concussion testing information, and OCEP requirements. If you are a new official, it is recommended to attend at least one of your association's training meetings before taking the rules exam. Get Training from your Local Officials Association. Check with your association for any additional membership requirements, training meeting schedule, and assignment procedures. Multi-sport officials receive a discount if registering for multiple sports withing the same membership year. Once you have completed the online registration process and consented to a criminal background check, the OSAA office will mail you an officials packet. Packets are send via US Postal Service to the mailing address provided in the registration process. Officials will be sent an email once their packet ships with a tracking number. Please allow up to 5 business days to receive your packet. If you have not received your officials packet, please contact Meridith Pyle at the OSAA office by calling (503) 682 - 6722 x224 or email meridithp@osaa.org. Packet contents vary by sport and additional information on exactly what is included for each sport's officials packet can be found with a price break-down of each item by clicking the specific sport to the left. The official must be a member in good standing of a local officials association. The official must complete the annual OSAA online officials registration process. The official must attend six study/training meetings or complete 10 hours of approved training. A crime involving a minor child at any time. The official must complete the annual OSAA concussion training. The full list of certification requirements can be found in the OSAA Athletic Officials Handbook (AOH). Training All OSAA officials in all sports must complete the annual OSAA concussion training course. Training must be completed before officials are allowed to officiate any contest. Online Exams Officials must annually pass an online rules exam for each sport they officiate. Testing is administered online through ArbiterSports. Exams are open book; no time limit. Officials have 3 attempts to complete the exam. Center To help officials and Commissioners understand the certification levels for officials listed in AOH Rule 4.2, the ArbiterSports system assigns officials digital eligibility badge icons representing the highest level of certification that official has obtained. The badges correspond to the levels of certification as follows. Registered - The official has completed the annual OSAA online officials registration process and passed a criminal conviction history screening (see (e) above). Registered officials who have not obtained a higher level of certification are prohibited from officiating any OSAA sanctioned contest. Sub-Varsity - The official has met the requirements of a registered official, taken the relevant NFHS sport examination, and completed any other required components (including (f) above). Sub-varsity certified officials are not allowed to officiate OSAA sanctioned contests above the sub-varsity level. Varsity - The official has met the requirements of a sub-varsity official, scored at least 75% on the NFHS sport examination, and completed any other required components. Varsity certified officials are allowed to officiate varsity and sub-varsity OSAA sanctioned contests. Playoff - The official has met the requirements of a varsity official, scored at least 90% on the NFHS sport examination, has OCEP Principles certification (see requirements), obtained and has current OCEP Playoff certification (see requirements), and completed any other required components. Playoff certified officials are allowed to officiate any level of OSAA sanctioned contest and OSAA State Championship events. It is the responsibility of the local officials association to establish membership and assigning criteria. Such additional qualifications may be no less stringent than the requirements established in the Athletic Officials Handbook. *Note: ArbiterSports assigns eligibility badges twice a day around 11 o'clock. It may take a while for the system to recognize eligibility completion requirements; for example, if an official only recently completes the rules exam, their badge may not appear until up to 12 hours later. The highest level of certification badge will be displayed. If an official obtains the playoff level of certification and receives a black badge icon, they are eligible to officiate sub-varsity, varsity, and playoff contests. However, an official that only has an orange sub-varsity badge cannot be assigned to a varsity level contest. The OSAA/OAOA Officials Certification and Education Program (OCEP) is designed to ensure that Oregon officials statewide are trained in a consistent and standardized manner. There are two components: OCEP Principles certification (AOH Rule 4.3) and sport specific OCEP Playoff certification (AOH Rule 10.2). As part of the Officials Certification and Education Program (OCEP), officials must obtain OCEP Principles certification within the first three years of officiating. OCEP Principles certification is gained by attending a course or clinic approved by the OAOA Executive Board on the basic principles of officiating or by completing the online NFHS Interscholastic Officiating Course. This requirement does not apply to officials certified by the OSAA in 2005-06 or prior; or any transfer official previously licensed or certified by a state high school governing body. Each local association should conduct an annual OCEP Principles course. It is highly suggested that these courses are offered to other neighboring associations of other sports to have a diverse participant base. For additional information, please refer to the OAOA Principles of Officiating Course. As part of the Officials Certification and Education Program (OCEP), officials selected to officiate any OSAA State Championship event must have obtained and be currently certified in their sport specific OCEP Playoff certification. To obtain OCEP Playoff certification, officials shall have completed an OCEP Playoff Certification Clinic, or other camp, clinic, or certifying procedure substantially equivalent and approved by the OAOA Executive Board in the applicable sport. Soccer officials obtain OCEP Playoff certification by completing the USSF Grade 8 Referee Course. Football, Volleyball, Basketball, Baseball, and Softball officials must recertify every five years via re-obtaining certification as described above. Wrestling officials must recertify every three years via re-obtaining certification as described above. Soccer officials must recertify every five years by attending one of the following training opportunities: Oregon Referee Committee Regional Referee Clinic (also known as the ORC Intermediate Training Clinic), ORC Big Training Weekend, or a training session or clinic which is substantially equivalent to the previous two options as determined by the OSAA Soccer State Rules Interpreter. This requirement went into effect starting with the 2016-17 school year. Officials can check their individual OCEP certification status by looking at their ArbiterSports profile/custom fields or in the Eligibility Center. Be selected by their local officials association*. Be OSAA certified per AOH Rule 4.1. Obtained playoff level certification per AOH Rule 4.2.d. Obtained OCEP Principles certification per AOH Rule 4.3. Obtained and be currently certified in their sport specific OCEP Playoff certification per AOH Rule 10.2. At least five years of varsity soccer officiating experience to be eligible for assignment as the center referee for 6A and 5A OSAA Soccer State Championship events. Services 4A or lower classification schools during the regular season to be eligible to officiate any OSAA State Championship event involving 4A and lower classification schools. At least two regular season matches in each gender in soccer to be eligible for OSAA Soccer State Championship events. *State championship and playoff official selections shall be made by the commissioner or local association with input from the schools serviced by that association. Local associations may impose more restrictive criteria at their discretion regarding selection procedures. Wrestling officials are selected according to the process outlined in AOH Appendix A. Football, Soccer, Baseball, and Softball - no limitation. Volleyball and Basketball - limit of two consecutive years at any final site, regardless of classification. 1st Round Local Assoc. Local Assoc. Local Assoc. Local Assoc. Local Assoc. Local Assoc. 2nd Round Non-Local Assoc. Non-Local Assoc. Non-Local Assoc. Non-Local Assoc. Local Assoc. Local Assoc. QF Round Non-Local Assoc. OSAA/Final Site Non-Local Assoc. OSAA/Final Site Local Assoc. Local Assoc. SF Round OSAA/Rotating Assoc. OSAA/Final Site Non-Local Assoc. OSAA/Final Site Local Assoc. Local Assoc. Local Assoc. - The host school's local officials association will provide an officiating crew. Non-Local Assoc. - A non-local officials association will provide an officiating crew; any local association servicing more than 7.5% of schools sponsoring the activity shall be considered a non-local association. OSAA/Rotating Assoc. - The OSAA shall assign an officials association based on a rotating schedule to provide an officiating crew. OSAA/Final Site - The contest will be played at a final site and officials will be assigned individually by the OSAA. Note: OSAA contest officials are not to interpret OSAA rules. Practice/game limitations, player eligibility, and other rules governing schools outside of the NFHS rules of that particular sport do not fall under the purview of the official. Per OSAA Board Policy 51, OSAA certified officials are required for all OSAA sanctioned activities at the varsity and junior varsity levels including jamborees*. Contests with participants of differing levels are considered a contest at the higher of the two levels (i.e. a varsity team playing a junior varsity team is considered a varsity level contest). Schools have the responsibility to request permission from their local officials association to use non-certified officials at sub-varsity contests where certified officials are not required. *Exception: OSAA certified officials are required in baseball and softball at the varsity level only. OSAA certified officials are required in football at all sub-varsity levels. These are some of the OSAA policies and forms that relate directly to officials. NFHS Rules and Case books for each sport, right in the palm of your hand. A printed copy of the sport's rules book, and case book when applicable, are included in the Officials Packet mailed to registered officials. Registered officials can access all NFHS online publications via the NFHS Central Hub on ArbiterSports; your Arbiter login is required. Download the NFHS Rules app from the Google Play Store or iTunes App Store; you can use the links above. Open the NFHS Rules app on your mobile device. At the bottom of the screen, select "Signup". Enter your name and profile information. The email address you type in MUST match the address you used to register on ArbiterSports. Once registered with your account, within the app go to the "My Books" section. Here you will see a download icon for the free books assigned to your sport(s). All other books will show a shopping cart icon to subscribe to the book for $6.99. Your free books will appear under your subscription within 24 hours after registering on ArbiterSports. The following people are the State Rules Interpreters (SRI) for their respective sports. Commissioners and officials are encouraged to contact the SRI for rules clarifications. The following list shows every local officials association and Commissioner by sport. For updates, corrections, and additions, please e-mail support@osaa.org. All officials will now have an opportunity to nominate players, teams, coaches, and fans for exhibiting good sportsmanship via a brand-new sportsmanship award program. You can nominate any school, team, fan section, or coach by quickly using the drop-down boxes and share the outstanding example of sportsmanlike behavior you witnessed. The nomination will then go to the OSAA, who will, in turn, let the school know they were nominated and why. At the end of each sports season the program with the best nomination for sportsmanship for each sport will be announced and that program will earn 100 Oregonian Cup points for their school. Be on the lookout for great examples of sportsmanship and vote today!